Gold Rush Toxic Legacy- Altoona Mine Mercury in Trinity River- The Altoona Mine is located in Trinity County on the East Fork of the upper Trinity River above modern day Trinity Lake. In 1944 the Altoona mine was the 9th largest mercury producing mine in the country and its output was several times that for years, like many other early Gold Rush mines, Altoona operated in comlete dis-reguard for the native foods, native peoples, the lands in which we lived and the wild life there. The exsploitation by hydraulic and hard rock mining in the area led to the name "the Northern Mines". Of the 26 million tons (26,000,000) of mercury used here 8 million tons,today, remains un-accounted for. The mining process included the extraction of raw gold from ore bearing minerals, these processes changed over time from simple stamp or wheel mills, used to crush the ore. Changed when larger mechanized techniqes were available to blast furnace smelting processes that introduced into the local environment minerals like aresenic, mercury, lead, and sulphur. These methods were used in large scale industrial processes for decades in the mining extraction methods, and the discharged into area rivers and streams where residual particulates remain to this day. These toxic discharges from the former mines resulted in massive wildlife kills early in the historical era. 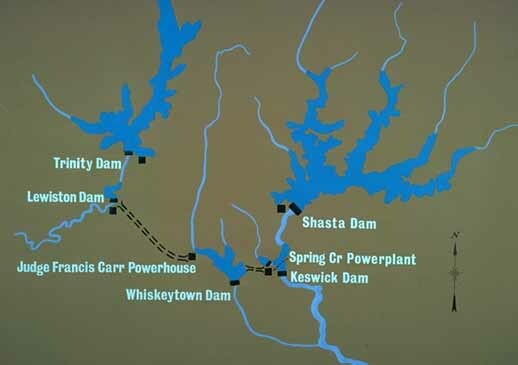 Today the poluted alluvual depostits are situated along the Trinity and Lower Klamath Rivers and under Trinity Lake behind Clair Engle Dam, where natural water flows from the Trinity River are diverted in tunnels and emptied into the Sacramento River at the Spring Creek arm of Keswick Lake for irrigation purposes.The system is known as Trinity Project portion of the Central Valley Project or CVP (map). When built Trinity Reservoir impeded the upper Trinity River, blocking contaminated sediments beneath the reservoir, some of which still continues down the Trinity River. Recent studies by the U.S. Geological Survey and the State Water Resources Control Board indicated that some species of fish in Trinity Lake and other water bodies in the Trinity River watershed contain elevated levels of mercury and could pose a health risk to people who eat them frequently. In northern California water bodies mercury is a legacy of gold and mercury mining activities that began during the Gold Rush and continued until approximately 1960. Both gold and mercury were mined in the Trinity River watershed and some mercury remains today. The inactive Altoona Mercury Mine is located along the East Fork Trinity River and is reported to contribute significantly to the mercury content of Trinity Lake. Current USGS H2O testing is focused on the East Fork main stream and tributaries and continues in 2008. Excessive exposure to methylmercury can affect the nervous system leading to subtle decreases in learning ability, language skills, attention, and memory, developing fetuses and children are especially sensitive. Symptoms at higher levels of exposure could include loss of coordination and vision problems. Mercury concentrations in samples of water, sediment, insects, amphibians, and fish indicate that the inactive Altoona mercury mine, which drains into the East Fork Trinity River, is a significant contributor of mercury to Trinity Lake. Ongoing studies are focused on understanding the fate and transport of mercury from the Altoona mine into Trinity Lake. 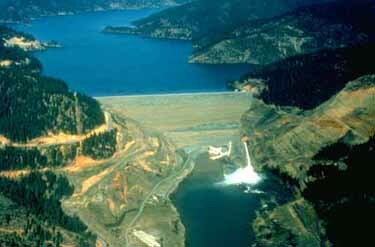 These mercury contaminants effect the last endangered runs of west coast wild chinook, coho, and steelehead. 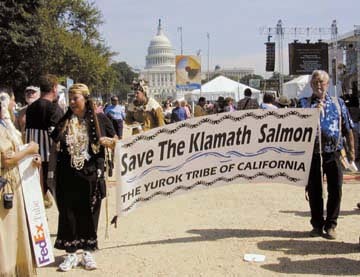 And these anadroumous fish constitute the native fishery of the Trinity-Klamath Watershed, protected and guarenteed by federal legislation. The last large native fishery in California.